At the end of May, I’m going to Beijing for two weeks. I’ve never been to China before. I’m going to be visiting a friend of mine from University. It’s interesting because unlike other global cities such as New York, London, Paris—places that long before I ever saw them in person, I had seen them repeatedly in film and on TV and in magazines and newspapers—I have almost no real imagination of what Beijing is like. I can’t picture how the streets feel or what the everyday architecture (houses, schools, offices) might be like. 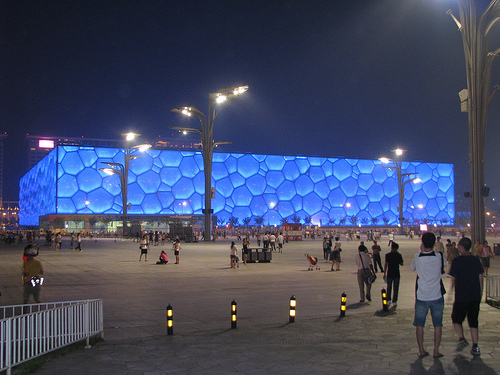 Of course, I know some of the iconic buildings from the 2008 summer Olympics (the Bird’s Nest and the Water Cube), as well as the Imperial Palaces of the Forbidden City and the uncanny, Rem Koolhaas-designed CCTV building. But those are all otherworldly oddities (I’m assuming) in the city, and not what you would see walking down your average street (whereas in New York, I was familiar with brownstone walk-ups from the age I started watched Sesame Street). So when I picture Beijing, I draw a blank. But I also feel that visiting Beijing right now is in someway visiting the centre of the earth—the new control centre for the global economy (sorry Washington, Manhattan and elsewhere). So I can imagine that whichever part of the city I go to there will be rumble of construction underfoot, and everything changing all around me almost as fast as I try to register how it is. This entry was posted in The Great Outdoors and tagged Architecture, Beijing, Bird's Nest, CCTV Building, China, Design, Rem Koolhaas, Travel, Water Cube by mmhague. Bookmark the permalink.